Assembly of a honed engine where a Torque Plate is NOT fitted during machining is subject to dimensional variations of .003” to 0.004”. 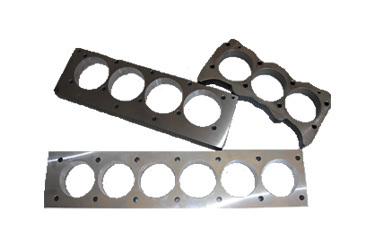 Torque Plates are designed to the same specifications as the head of that particular engine. They are bolted to the block with the same tensions used to fit the head and gasket to the block. By honing a cylinder with the Torque Plate fitted, you are creating the same conditions in the bore that the engine will experience under normal operation. Therefore, the resulting hone will be perfectly round when the engine is assembled and correctly tensioned. Performance engines operate under extreme pressures, at high temperatures and high RPMs. Diesel engines operate under even higher loads. These conditions ultimately contribute to the potential for damage and severe wear. Combining Torque Plate honing with the correct cylinder finish for your application, will ensure your engine has a longer life and achieves optimum power potential. This allows the motor to optimize power output and last longer. The question is, can you afford not to use a Torque Plate? Click on the link below for our comprehensive list of Torque Plates. Mild Steel Plate Grade 250 Flame Cut steel plate and wash ground to 40mm nominal thicness and finish machined as required.